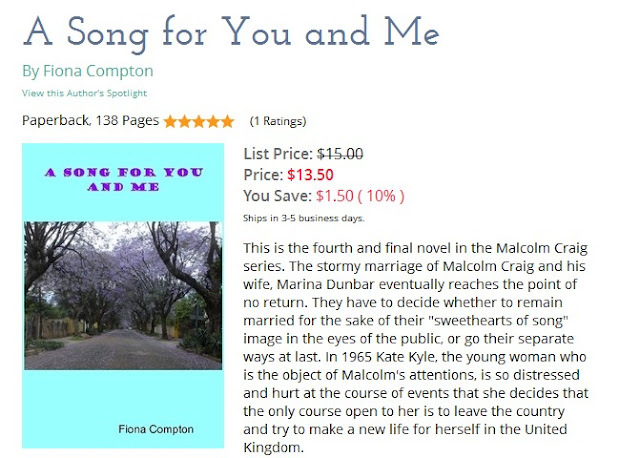 FIONA'S FICTION: A SONG FOR YOU AND ME - Final novel in the Malcolm Craig Series. A SONG FOR YOU AND ME - Final novel in the Malcolm Craig Series. 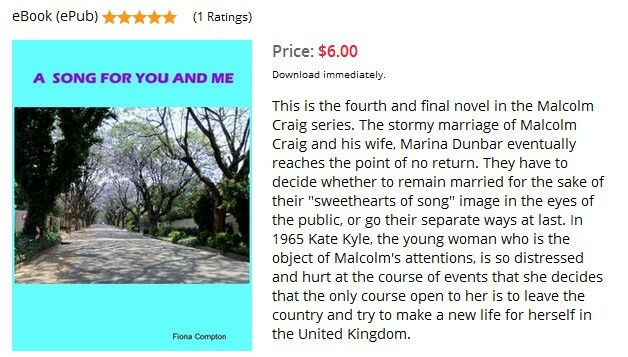 I completed writing A Song For You and Me during the NaNoWriMo month of November 2015.This is the final novel in the Malcolm Craig series. It is available as a paperback print and an Epub. Pearl Harris is a highly-qualified writer, editor, proofreader and translator. I have finished reading the final novel in the Malcolm Craig series and it held my interest even more than the three earlier books, as the final novel eventually reaches a conclusion to the saga. 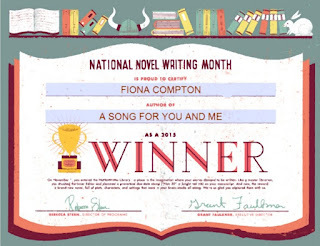 Like the Christmas Special which concluded the long-running Downton Abbey, the end of Fiona Compton's novel reaches a satisfactory resolution.The finale of the Malcolm Craig series is merely implied, rather than described in graphic detail, and one is left to imagine what happens to Malcolm, Kate, and Marina in the years that follow. 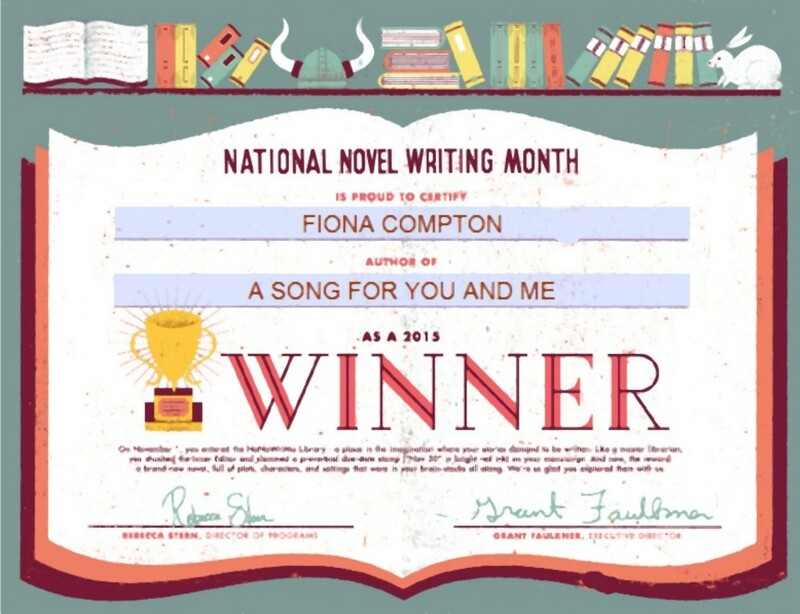 Somehow I doubt whether the end of the series is the way the tale ended in reality, but perhaps that is why Fiona Compton chose to present it as a work of fiction rather than fact. I was rather surprised when Steve Baxter phoned to ask me if I would be a guest on his radio programme in a few day’s time. Considering how devoted he was to Helen and how studiously he had avoided me since our affair and our ill-fated holiday together the year before, I was amazed that Helen had allowed him to ask me to do such an interview. “Do you think that is a good idea, considering our history, Steve?” I asked. As I expected, Malcolm didn’t care one way or the other whether I did the interview or not. “So you wouldn’t care if I decided to have an affair with someone else?” I asked. He marched out of the room leaving me feeling quite miserable, but angry at the same time. I picked up the telephone. It was Helen who answered in obsequious tones, “The Baxter residence,” she simpered. “Is Steve there?” I asked without any preliminary greeting. “Who shall I say is calling?” she asked – as though she didn’t know! Surprisingly the interview went better than I expected it to. We chatted about this and that and ended the interview with Malcolm’s recording of One Day When We were Young. “Thank you, darling,” I said in sugary tones when it finished. I was surprised at how I could put on such an act when I was feeling entirely fed up with my unsatisfactory life. The only person who was cheering me up these days was our singing pupil, Brandon Black, who thought the world of me and was willing to do anything possible to please me. In a way he reminded me of Harry, although there was no question of going to bed with him at this stage. I was twelve years older than him, and although I knew he thought the world of me for the moment it was better to be good friends without the complications a sexual relationship usually brings. I returned to the studio immediately after the broadcast. Malcolm was having a rest before the next pupil arrived. There was a faint smell of perfume in the air over-riding the usual smell of his stale cigarette tobacco. “Did you listen to my broadcast?” I asked. “Yes! Very well done,” he said absently. Who was in the studio while I was away?” I asked sharply. I couldn’t be bothered to argue with him. The next pupil was due any moment and I didn’t want to upset myself by asking if Kate had been in to see him because she knew I would be at the radio studios and had taken any opportunity to be with him. I let it go, but my suspicions remained. 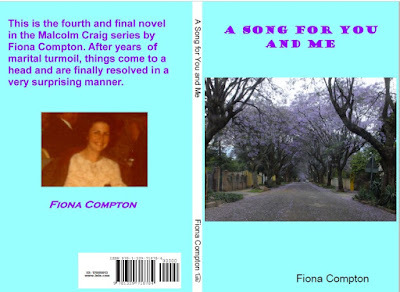 The book is published as a paperback and an epub. 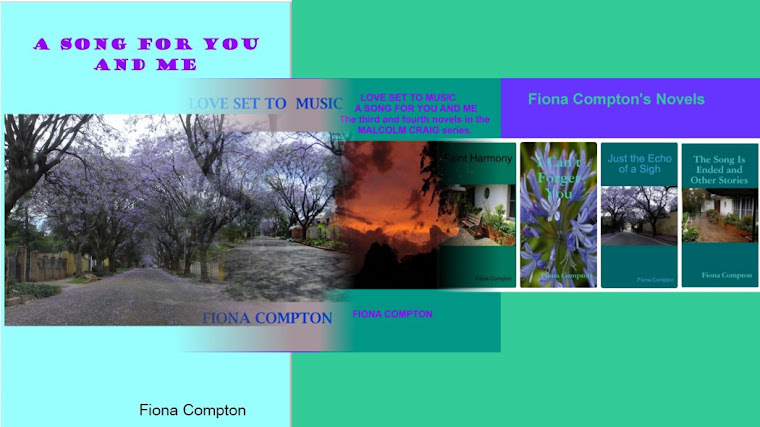 Read more about it at: Fiona's Store - Fiction with a Musical Theme.